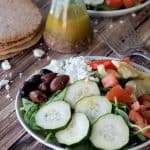 A healthy Mediterranean style Salad filled with kalamata olives, artichoke hearts, cucumber and feta then topped with a homemade Greek Vinaigrette. Heat a small skillet to medium high heat. Add 1 teaspoon of olive oil and chopped red onion. In a small bowl add lemon juice, red wine vinegar, dry oregano, crumbled feta cheese, salt, pepper, sauted onions, and olive oil. Whisk until all combined and you can no longer see the oil vinegar separation. Set aside. In a large bowl add baby spinach, oasted red pepper that has been julienned, quartered artichokes, kalamata olives, chopped roma tomato, sliced cucumber, and crumbled feta cheese.